Det är 3 svar i den här tråden, och den har visats 1370 gånger. 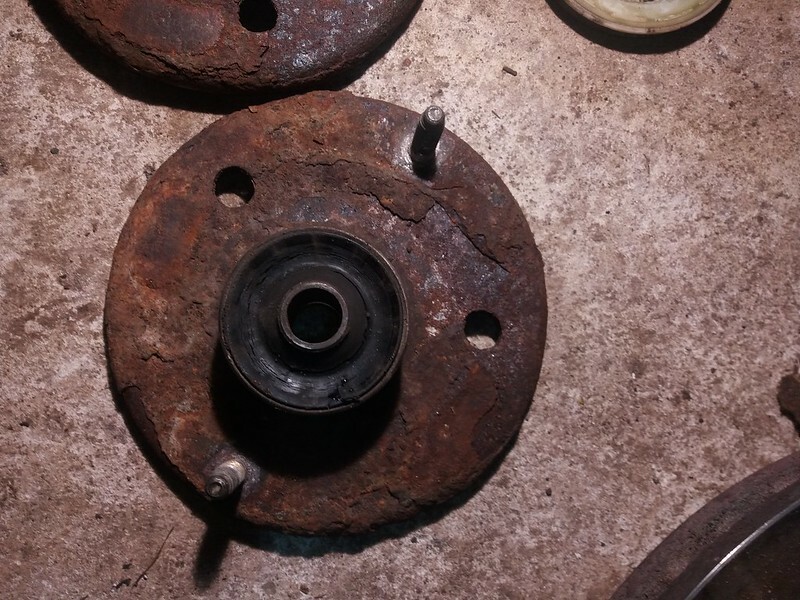 This is a small guide on how to change your Volvo 7/940 front springs and shock absorbers. I will use older and newer pictures, but the quality isn't good, sorry about that. EDIT: I reassembled the rubber bushing on the strut plate the wrong way around. It should be orientated like in the first picture but I assembled it the wrong way(look at the last picture). What do the members think, how serious is it? First, jack up the car and block the rear wheels, take off the front tire. Before you start the work, I would mark the locations of the strut bearing 15mm nuts with a marker to make sure you get the alignment as close to before as possible, but you still might have to get a tire alignment. Next, remove the two 18mm bolts holding the brake caliper assembly in place and put it away, on the wishbone or put a bucket under it. 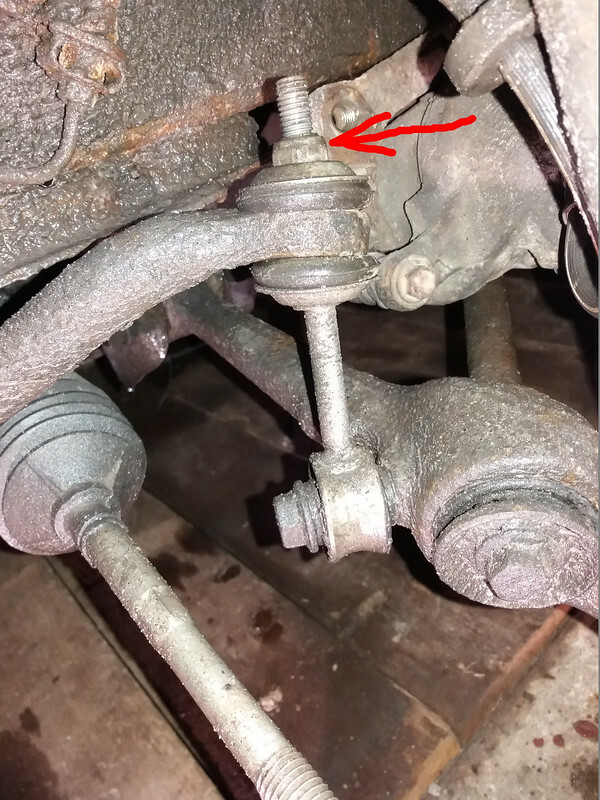 Then remove the two 18mm or 17mm bolts holding the ball joint to the strut. 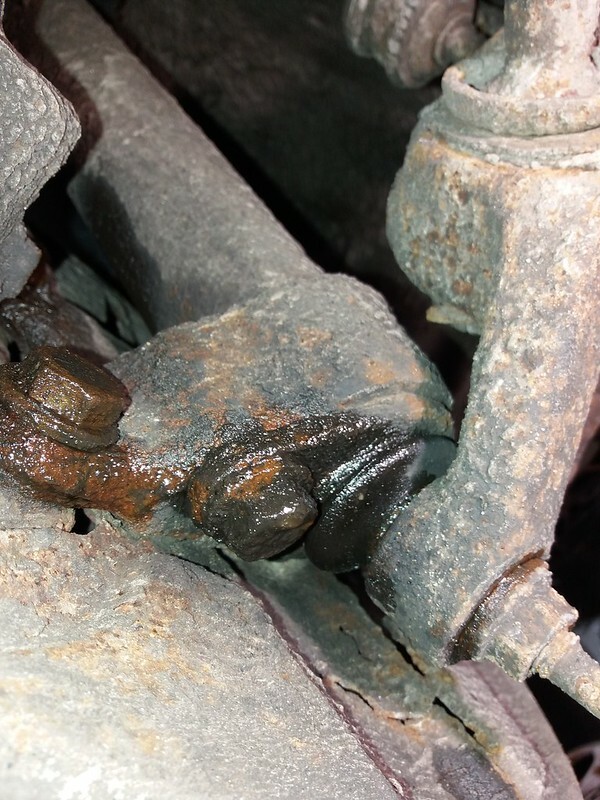 Then loosen the 15mm bolt on top of the stabilizer bar, so you could move the wishbone down. 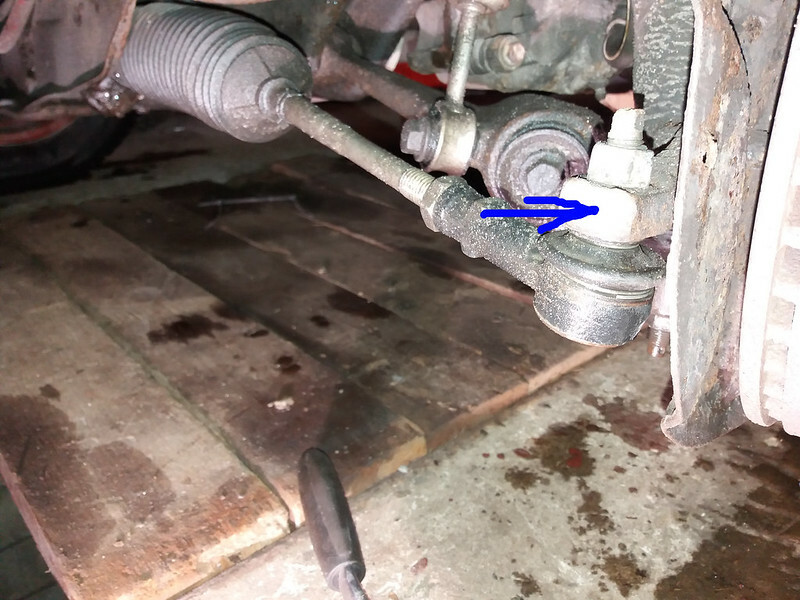 If you want to, you can remove the lower 17mm bolt, that connects it to the wishbone. Now, pry the wishbone down and lift the strut off it. You can choose to remove the brake disc if you want to, but it didn't bother me. Loosen the 15mm bolts under the bonnet (first picture). Do not loosen the big 24mm bolt!!! Now, put the spring clamps on the springs, lubricate the threads with oil and start to put tension on the spring. 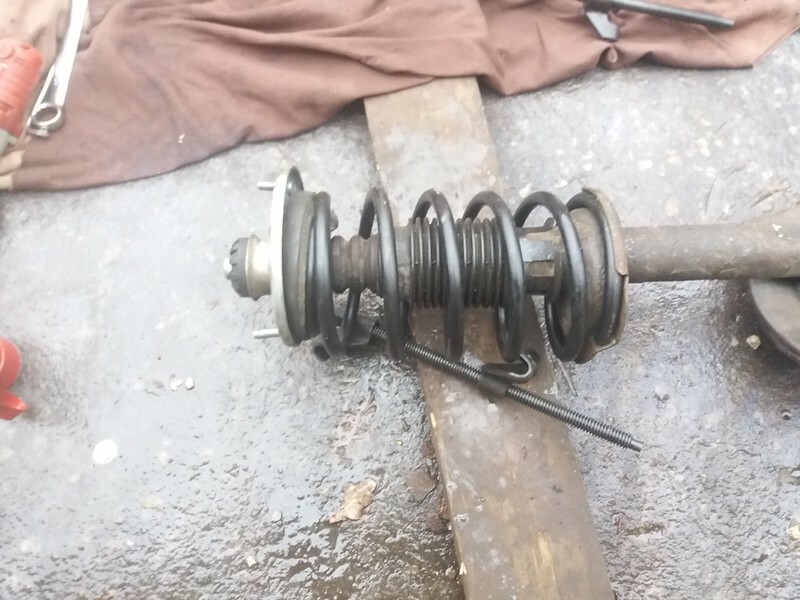 Make sure the spring is as straight as possible. If you have compressed the spring enough and you can move it in the strut, take your 24mm wrench and a T45 torx and loosen the upper big bolt. 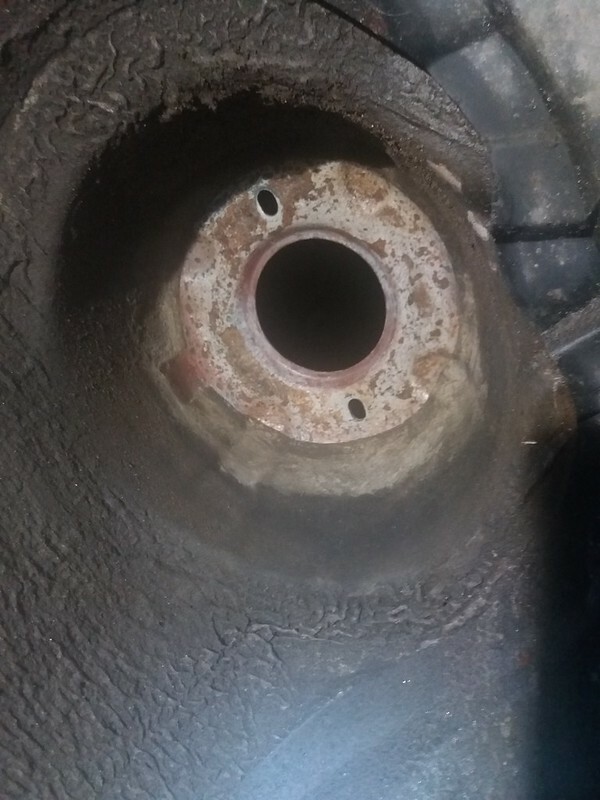 Don't lose the big rubber bushing that goes between the nut and the plate. 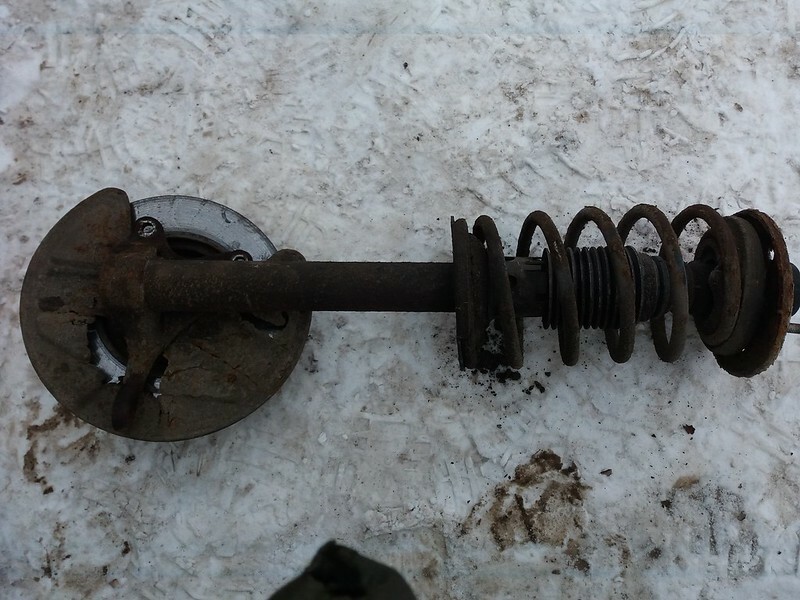 When removed, lift the spring out. 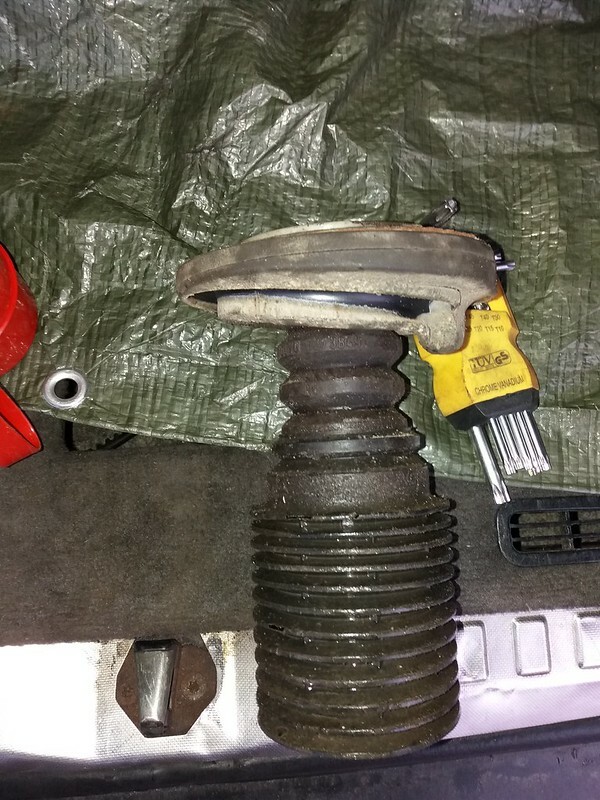 and release the pressure on the spring evenly (if you only want to change your shock absorbers, leave it like that in a safe space), remove the top rubber part with the bearing from the spring, you should have these removed. 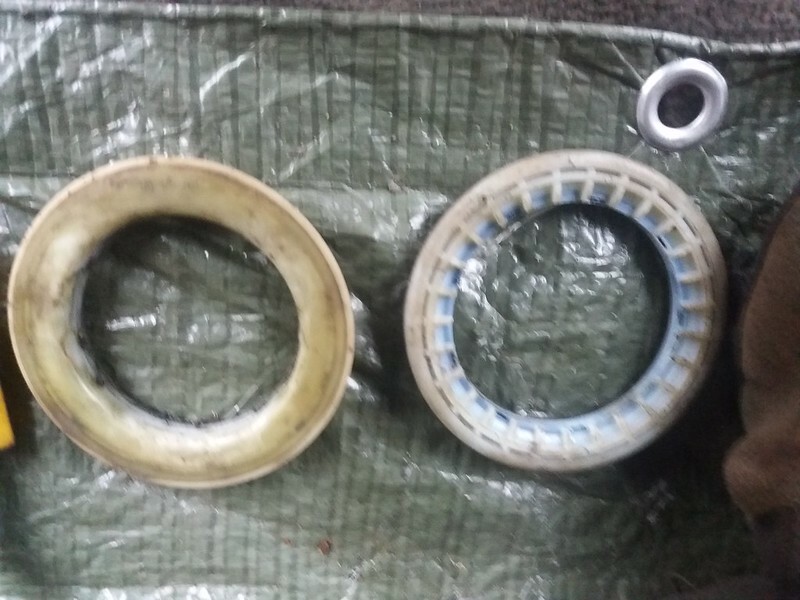 Check if your new bearing has grease in it, never put in bearings dry. 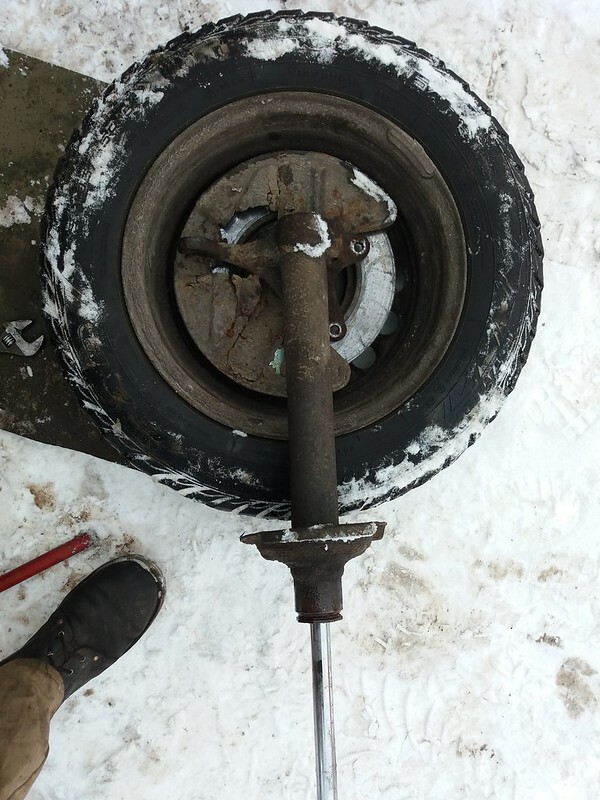 Attach a wheel to the bolts and have a heavier friend stand on the wheel while you try to loosen the nut. Remove the nut, insert a new shock absorber, tighthen the new nut. 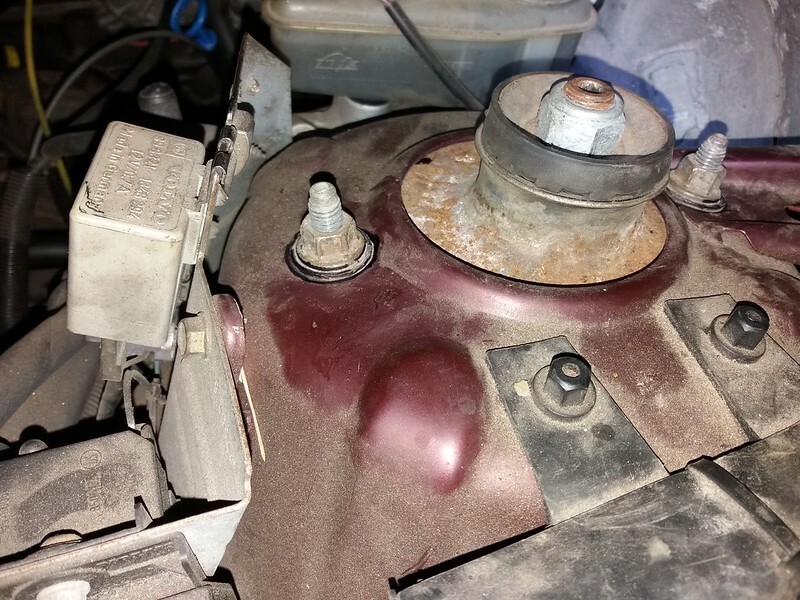 Put the new spring in place (it needs to be compressed) then put the dust cover in, attach the rubber to the spring's upper part, and the new bearing with the plate. tighten the 24mm nut and decomress the spring slowly. This is also a good time to clean all the surface rust under the strut tower. Put the strut back into the car, tighten the two 15mm bolts under the bonnet and reassemble everything. I hope this guide helps you, but remember to think with your own head! I am not an auto repair technician so there might be some mistakes. A great guide guide as usual Torbik. And very clear and good pictures . I recently did a replacement with that part in this guide with the the ball joint to the strut.. 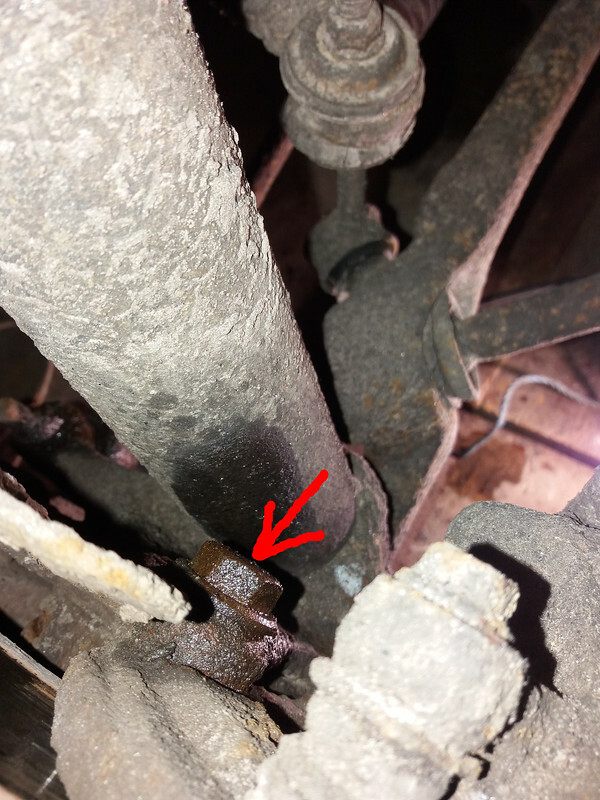 It was so rusted stuck that i had to replace the whole strut. It was so bad but got it on a video on Youtube. 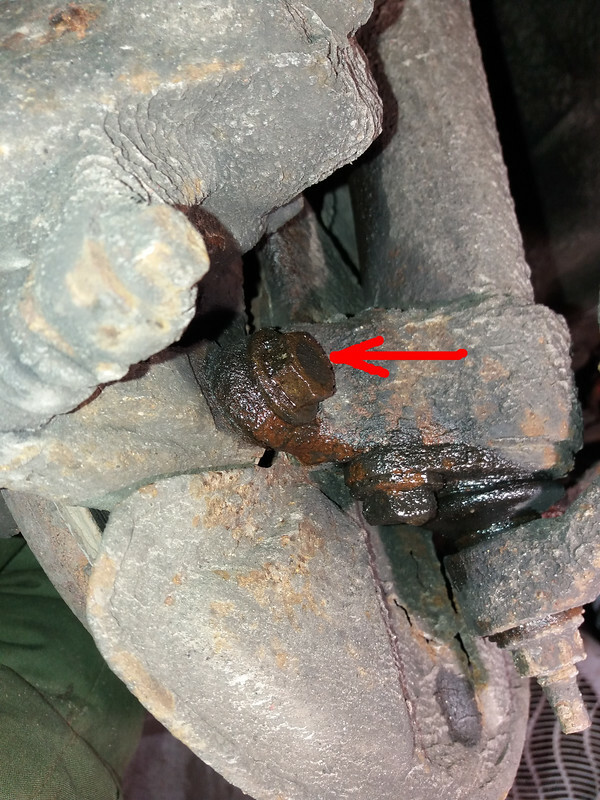 With the car on the ground I loosened the 24mm nut again and turned the bushing the right way. 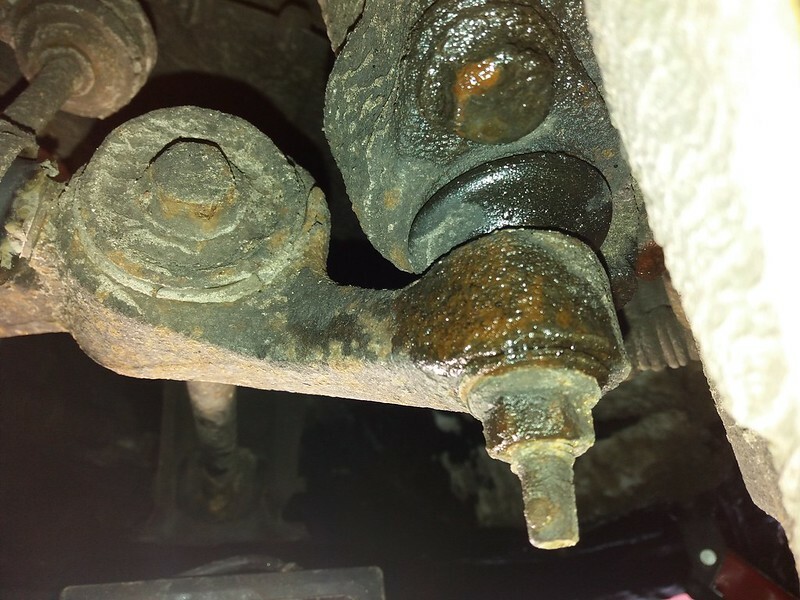 Sladdaren - yes it can be rusty, when I changed my shock absorbers, one of the large nuts was so rusted that it broke off. I even tried to weld something to it so I could turn if, but it didnt work and I had to buy a new strut aswell.